Recipe by Chef Bill Briw. Recipe created by The Culinary Institute of America as an industry service to the U.S. Potato Board. Photography courtesy of Kristen Loken. Combine all ingredients listed under potatoes in a heavy-bottomed pot and bring to a gentle simmer. Once it reaches a simmer, turn down the heat until there are just very small bubbles in the pot and cook until the potatoes are tender. Cool the potatoes in their cooking liquid in a shallow pan. Once cool, cut the potatoes in half lengthwise. The cooking liquid can be used again for the same purpose and so should be reserved. For the dressing: Create an Asian flavor base from miso, vinegar, mirin, and sesame oil and add this to your vinaigrette. 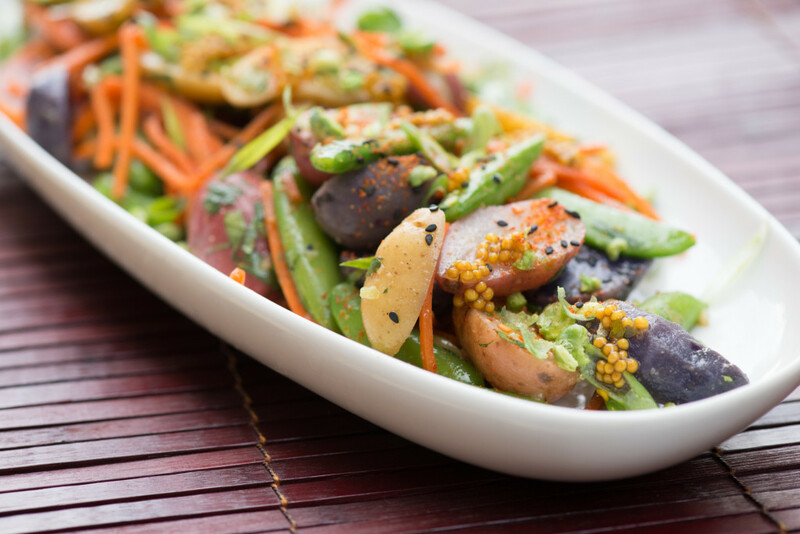 Taste the dressing and adjust the seasoning as needed Mix the potatoes with the carrots and snap peas, and dress with the Asian vinaigrette. Season to taste and garnish with your favorite Asian garnishes as listed in the ingredients Pickled Mustard Seeds In a small heavy sauce pan cover the mustard seeds with water and bring to a boil. Drain the water and rinse the mustard seeds. Repeat the blanching a second time. Drain the water, rinse the mustard seeds and add the vinegar, sugar, salt, soy sauce, and spices in a small heavy saucepan with the blanched mustard seeds and bring to a gentle simmer over low heat. Cook, stirring often, until the mustard seeds are plump and tender, about 15 to 20 minutes. The liquid will be nearly absorbed, but the seeds will remain moist in very little thick viscous broth. Cool the seeds in their liquid and refrigerate in a covered container. It will keep for months..